During the month of September I signed up, with some friends, to Scope’s Steptember Challenge. You commit to walking 10,000 steps per day for 4 weeks and raise money and awareness for Scope. I’m pleased to report that I managed over 10,000 steps every day, apart from one day where I wasn’t feeling well. I logged a total of 348,951 steps, that’s a daily average of over 12,400 steps. Yet more proof that my days of having to limit my physical activity are over. I have decided the time has come to get rid of two books I bought to help my recovery. I would like these books to go to someone who would benefit from them, so I am using the blog to give them away. A brief description of each book can be found below. If you would like one or both of them please email me at eat4meblog@gmail.com and I will choose a suitable new home for them. Depending on the level of interest I may give both books to one person, or split them into separate lots, so please state which book(s) you are interested in when you message me, and include your postal address. I will cover all postage costs to addresses in the UK. Chronic Fatigue Syndrome can turn every waking moment into a physical, emotional and cognitive struggle. The extreme exhaustion that characterises the condition is often misdiagnosed, leaving the sufferer to cope with the untreated causes for many years. Dr Kristina Downing-Orr , a respected clinical psychologist, suffered from severe symptoms and was compelled to research the underlying causes in order to cure herself. Her recovery was quick and lasting, inspiring her to share her own groundbreaking treatment programme with others. Beating Chronic Fatigue is the culmination of her own experiences, clinical expertise and pioneering research. This much-needed guide provides fresh hope for sufferers and their families that recovery is possible. In Beating Chronic Fatigue, you will discover the real causes and symptoms and a step-by-step treatment programme that will help you regain your health, energy and vitality. 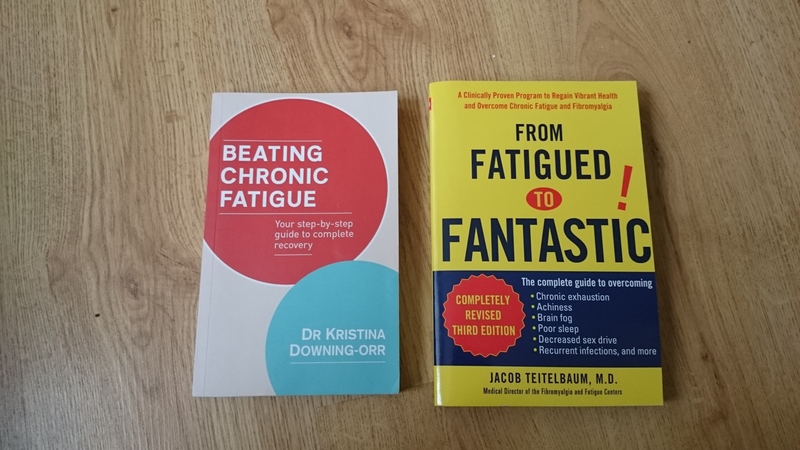 From Fatigued To Fantastic by Jacob Teitelbaum, M.D. The original, bestselling guide to treating chronic fatigue and fibromyalgia-now completely revised and updated. For the more than twenty-five million Americans who suffer from chronic fatigue, fibromyalgia, and other fatigue-related illnesses, there is only one bestselling guide-From Fatigued to Fantastic. This new, completely updated third edition incorporates the latest advances in science and technology to help alleviate the baffling, often dismissed symptoms associated with severe, almost unrelenting fatigue. Dr. Teitelbaum’s integrated treatment program is based on the clinically proven results of his landmark study and on his more than thirty years of experience in working with patients to overcome their illnesses. Using the most current information, Dr. Teitelbaum helps his readers evaluate their symptoms and develop an individualized program to eliminate them. Specific guidelines for diagnosis and care are clearly and concisely presented, along with supporting scientific studies and treatment recommendations that include the latest and best strategies for using prescription and over-the-counter medications, nutritional supplements, alternative therapies, and/or dietary and lifestyle modifications. In addition to providing cutting-edge research, up-to-date scientific information, and practical advice, Dr. Teitelbaum offers the compassionate understanding of one who has himself battled and overcome these disorders. Remember; if you would like one or both books please email me at eat4meblog@gmail.com and I will choose a suitable new home for them. Depending on the level of interest I may give both books to one person, or split them into separate lots, so please state which book(s) you are interested in when you message me, and include your postal address. I will cover all postage costs to addresses in the UK. The lucky recipient(s) will be chosen on Tuesday 20th October.